The pairing of deep chocolates and dusty violets was a major trend at the 2008 National Stationery show. Here are just a few items that feature this stunning color combination. 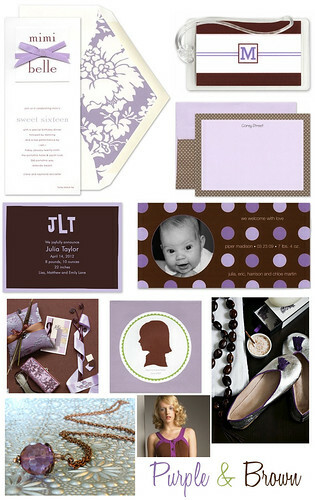 Clockwise from top left: Vera Wang lavender and chocolate sweet 16 invitation, fontaine maury modern monogram luggage tag, SanLori violet and brown polka dot stationery, a bold lavender and dark brown birth announcement by Robyn Miller, baby idesign purple polka dots on brown photo birth announcement, silver & purple ballet flats on brown, marc jacobs dress at Bergdorf, amethyst lantern necklace, gallery photo from theknot, fontaine maury custom canvas silhouette (love the green accent). Purple & Brown has already been named a hot color combination by The Knot and our wedding consultants informed me that purple and brown wedding invitations & announcements have been incredibly popular with our brides-to-be. Only time will tell if this trend will move from stationery & wedding day looks to every day design.